A new year. A new website. I’m back in full writing mode, and how glorious it is! It’s doubtful I would be feeling so cheerful and inspired right now if it weren’t for Betty Neels. Montana winters can be grueling with one bitter cold, gray and dreary day leading to the next. My daily morning walk (no matter the weather) with my faithful Australian Shepard, Annie, at my side, gets the day off to a brisk, refreshing start, but—unless the sun decides to make a brief appearance to remind us Montanans that it still exists—my morning energy has said farewell by early afternoon. Back in late December on a particularly cold and dark day, one of my neighbors shared with me that he and his wife are moving to North Carolina this summer. “For good!” he said, rubbing his gloved hands together and stomping his booted feet in the snow to keep warm as we chatted. “It’s more for me than her, though. I’ve got SAD. Have to sit under one of those special lamps for a couple of hours every day. I’m driving her crazy.” I commiserated with him. Then, occasional forward thinker that I am, I asked him what he was planning to do with his snow blower since I doubted he’d need it in that southern clime. “I’ll give you first dibs. Hundred bucks.” Visions of me not having to shovel my driveway next winter lifted my spirits for a few hours. Yet, it still wasn’t enough to inspire me to write the next chapter in my book. Gloom was settling in as I wandered over to my bookcase and scanned its offerings. Sun and Candlelight by Betty Neels. Well! How perfect is that! Soon I was immersed in Betty Neels land, journeying with a British nurse (circa 1979) to Holland with her Handsome Tall Broad Shouldered Dutch Doctor Husband. One of Betty’s Marriage of Convenience story-lines, old-fashioned to some but as timeless and lovely as it was the first time I read it many years ago. sausage rolls, madeira cake and thin slices of buttered toast eaten in front of a cozy fire, a big furry dog of “dubious lineage” draped across my feet, a wise old cat keeping an eye on us from its perch on the mantle. I shopped for Jersey Dresses, and dinner dresses, fur hats, practical felt hats, rain coats, headscarves and Sensible Shoes. The thing about Betty Neels—and all true Betty Fans can confirm this­—is that you can read any one of her books a dozen times over the years and still feel like you’re reading it for the first time. Betty is that one true friend who is always there for you and will never let you down. There’s a reason why the 135 romance novels she penned for Mills & Boon have been published and re-released and have never gone out of circulation since her first novel, Sister Peters in Amsterdam, was introduced in 1969. Here are the covers over the years for just one of her books (Tabitha in Moonlight, one of my Top 5 Favorite Betty Neels) from its original release (1972) to its current release. And these are just the English versions! Betty was 60 years old when her first book was published. She was 91 when she passed away in 2001. Her last story, An Independent Woman, was released that same year. Corrected 2/21/19 – This is NOT Betty Neels, but I decided not to remove as it was taken during the same era when Betty was a nurse. As a writer of what today is being called Clean Romance, I find great inspiration in Betty’s life story and her writing. I can only dream of having the success that she achieved. But I take heart that her books, in which the Hero and Heroine never take the reader further than a kiss, have maintained (and very likely grown) in popularity over the years. Because of Betty, I know there will always be a place in readers hearts for sweet and decent (and well written!) romance novels. So, Thank You, my dear good woman, Betty Neels. Spring will soon be bringing its sunshine and two new books from Yours Truly. I’ve taken a look at your Pinterest board. I love it! I would have kept the M&B cover too, Betty Maggie – because of the banner: Betty Neels’ 100th Romance. Her 100th novel! Quite an achievement! Yes, I do have “The Proposal” in my Kindle collection, the Mills & Boon edition, which unfortunately you don’t get in the States. I am blessed, because, in my country, Amazon offers both Harlequin and Mills & Boon titles. Thank you for this wonderful post. I am glad to hear Betty’s novels have been able to bring light and warmth into your cold dark Montana winter. It’s lovely to know there are so many more people who appreciate the Great Betty’s style of writing. Betty Neels has written 135 stories. One wonderful story more than stated on some pages! That is not a picture of the young Betty Neels. I know it has appeared on several sites, erroneously captioned Betty Neels. 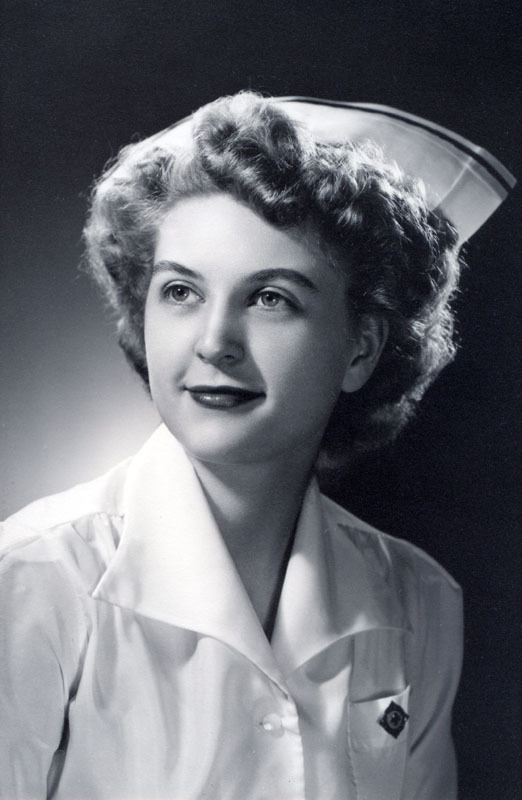 It’s the graduation picture of Nurse Gertrude/Gerty who attended nursing school at the University of Washington, graduating in 1948. I also have all but one of her stories on my Kindle and – for the first time – I’m reading them again in order of publication. The one story I’m missing is “The Proposal.” If that’s in your collection, please let me know!